Richlawn Turf Food supplies the university recommended 1 pound of nitrogen per 1,000 square feet. 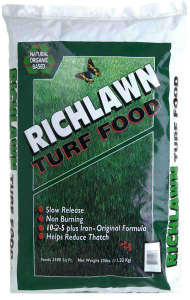 Richlawn Turf Food is made in Colorado and is designed for use in the western United States. Richlawn Turf Food is unique in its offering with its organic base. Richlawn is organic based with DPW (Dehydrated Poultry Waste). PRODUCT March April June July Aug.
For best results apply Richlawn Turf Food every 4-6 weeks according to the schedule indicated below. For correct application set your spreader open 60%. Example: If the numbers on your spreader range from 1 to 16, you would set your spreader at ~9.5 (.60 X 16 = 9.6). To avoid rust spots on concrete areas simply sweep any fertilizer from these areas before watering.